On 9 september 1918 the Latvian postal authorities give an order for the printing of 3.000.000 stamps. The value must be 5 kapeiki. In total 11.956 sheets of 228 stamps were printed: 2.725.968 postage stamps. The first stamps were delivered on 17 december 1918 on the main-postoffice of Riga. Some consider 27 december -the main postoffice of Riga under control of Latvia- as the first day of issue of the first Latvian stamp. The stamps were printed by printing house Schnakenburg in Riga, later -end 1919- the Latvian state-printing house. Here Mi. 1: imperforate: three ears of corn in a ring, surrounded by the rising sun and three stars: the three provinces of Latvia, Kurzeme, Vidzeme and Latgale. Some people see left and right ar its base leaves or little forest, but according Deryck Goodridge (see article here below) you must see it -and I like more this interpretation- as tiny hands welcoming the sun. Ansis Zihrulis (Ansis Cirulis) is the designer. Mi. 1, the backside of the stamps above. After the war in Latvia there was lack of paper, so the stamps were printed on the back of German military maps. Collectors can specialize in plate errors, but also in types of maps. In the beginning the sheets were imperforate, later with perforation 11½. Here you see a part of a sheet of the perforated Mi.2. Totally 2.725.928 stamps were printed, 11.956 sheets of 228 stamps, but it is not clear how much were imperforated and perforated. Probably more sheets were imperforated then perforated. There are used two lithographic stones for the printing and on the sheets you can find this indicated with Roman numeral I and II in the lower sheet margin. With this stone (5 x 5 clichés) are prepared the two plates: 12 rows with 19 stamp-designs in a row, 228 fields together. Some variations come by using this mother-stone transferred in the plate on the same positions in the sheet. Identification of fourteen of these variations -six on both plates and eight only on plate I – are in detail describes in the book ‘Lettland : Handbuch Philatelie und Postgeschichte’ (see literature below). For preparing the printing stones, or plate, one ‘mother stone’ with 5 x 5 designs is used. The arrangement with the ‘mother-stone’ on plate I and II differs in the last two rows. Both plates produced the stamp-designs in 12 rows of 19 stam-designs: 228 stamps in a sheet. Details of the exact arrangement of plate I and II is described in ‘Lettland : Handbuch Philatelie und Postgeschichte’ (see below). The finished military maps were 40-42 cm x 35-36 cm. Folded (horizontally in two, then vertically in three) the maps were about 14 x 18 cm, with visible the indication of the map (place, scale). 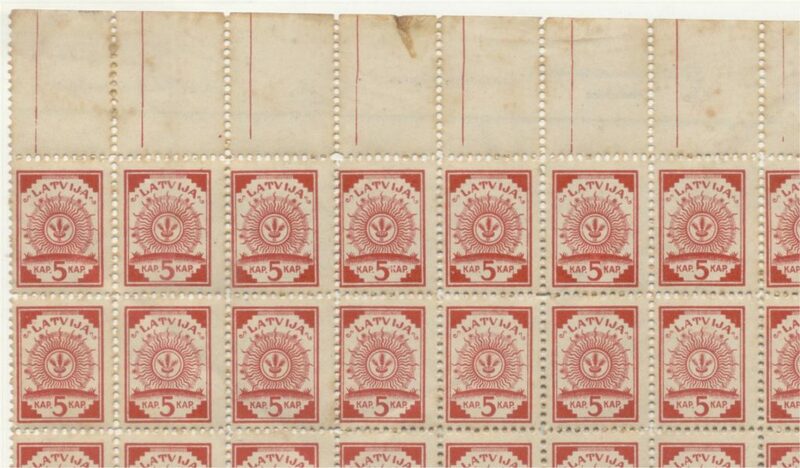 The unfinished sheeds, used for the Latvian stamps were about 41-44 cm x 36-38 cm. So the arrangement of the 12 x 19 stamps is the best. In the Handbook of Harry von Hofmann: Die Briefmarken in Rubel-Währung 1918 – 1922 / von Harry von Hofmann- on p. 49 is a list of the 79 maps so far recorded. Also is mentioned this map ‘Q17 Ponedele’. The indication you see on the edge. It is a ‘fine’ map. Das hat uns gerade noch gefehlt – Lettland No 1 als neue Ganzfälschung in kompletten Bogen / Harry v. Hofmann In: Philatelia Baltica 1995 ; 100. – S. 20-21. – About the same forgery. On January 3, 1919, Riga is occupied by Latvian Soviet Republic. On 5 January the provisional government goes from Jelgava to Liepāja and the second issue of the Sun design, Mi. 3 – 5, is printed by G.D. Meyer in Liepāja, issued January 8, 1919. More about the first Latvian stamp: on the site of Bill Apsit. -Latvia map stamps / John Barefoot. – York : J. Barefoot, cop. 1983. – 35 p.